I am catching up on my reading since writing my own book. This one w as on my list and it’s a page turner. Lynda is emotionally naked, revealing the cracks in her marriage, her family, and her own mental health along the way. Watching our loved ones self-destruct is agonizing and while our journeys are never identical, we can relate to the stories of others. And this one is definitely relatable. 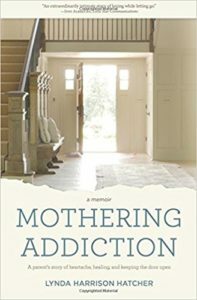 I found myself wanting to be part of her “book club,” the group of friends who had children mired in the struggle of addiction and how they supported and were there for one another. I tried desperately to create my own group of intimate support but it never worked out which was devastating to me. Thankfully, I found a Families Anonymous group that pulled me through. What Lynda does really well is help us understand, through her story, how to find your way to detach with love–separate yourself from the chaos of a child’s addiction and to lead your own life because their journey is not our journey. How ugly that journey is. How long, hard, difficult and painful. Not to mention the guilt of feeling like that child is being abandoned. And how many times Lynda faltered or relapsed along the way, succumbing to the agony and just checking out emotionally because she couldn’t take it any longer. How many times have many of us felt that way? Sam is the son who suffers from Substance Use Disorder, showing signs of impulse control early, one of the four traits identified as predisposing kids to addiction. Like many of us, we see those signs and struggle to keep things on track and find a place where our child fits, realizing that’s nowhere. Or nowhere cheap or close by. How other’s achieving children and the sage advice delivered by those parents prickles and validates feelings of our own parental inadequacy. You see how it effects the sibling, often silent sufferers who try to be “good” to balance out the chaos and can suffer their own issues as a result. She reveals the parts of her marriage that were brushed under the rug, and how the stress of and friction of a major disorder intensified those issues, sharpening the wedge that drove a dividing line between her and her husband. And how challenging it is to co-parent a child with SUD and how two parents are almost never on the same page. The book is a memoir that incorporates a message of personal growth and hope while not departing from reality by delivering an unrealistic lollipop land ending. Overall, this is a worthy read. And I think our stories are important so I hope you’ll share and support this author and her work. When you turn on your television, pick up just about any national publication or read your local newspaper, you’re hit in the face with a barrage of statistics about the addiction crisis. You may even know a family who’s lost a daughter or a son to an accidental overdose. No doubt, you’ve heard the hew and cry that the current opioid epidemic is considered the most destructive in history. It’s too overwhelming to absorb. Is it possible to put any of the toothpaste back in the tube? If there’s a chance to turn things around in this country, how and where do we start? My prayer is that we would start with COMPASSION. Compassion literally means “to suffer together.” It’s the feeling that arises when you’re awake to another’s suffering and you’re moved to ease their pain. The giving and receiving of compassion is a sacred act and simply put, our world needs more of it. Compassion for addicts is in short supply, as it is for the struggling families who must build brave and heartbreaking boundaries in order to pursue their own health. However, in order to survive, we must learn to practice, practice, practice the Golden Rule – to love ourselves as we love our child, our spouse, or our neighbor. 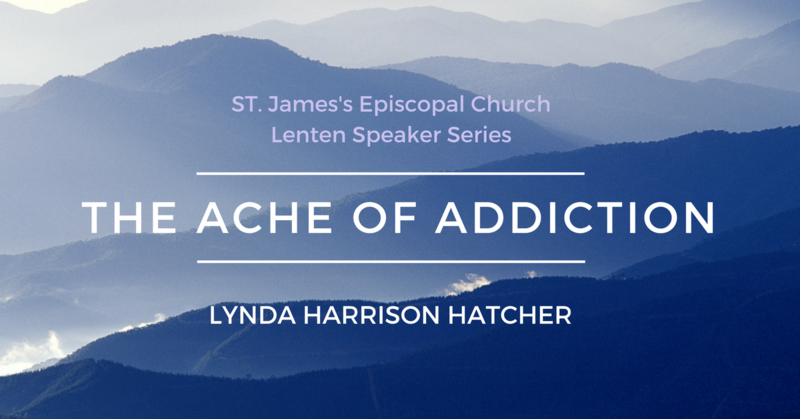 I am honored to be participating in “The Ache of Addiction” Lenten Speaker Series at St. James’s Church in Richmond, VA. on Monday, March 19 at 6:00 pm.